If you work on Wall Street, you know that it can be challenging to get out for lunch. More importantly find a good spot for lunch. After you hit the same old same old, you have run out of options. Burgers, pizza, sandwiches and salads….BORING!!! Wouldn’t you love to eat a HOT meal and be civilized? Now you can. 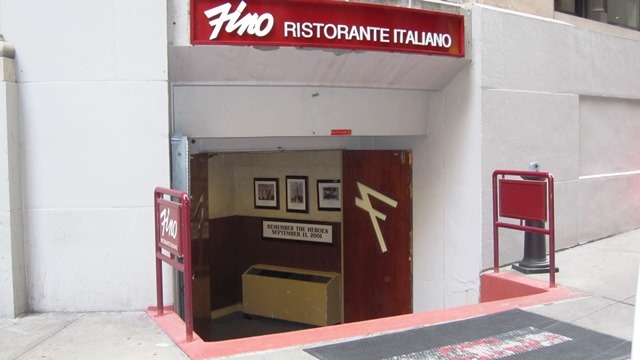 Fino Ristorante Italiano is an upscale Italian Restaurant located at 1 Wall Street Court, that little side street off of Pearl & Wall St. Uh Cheapeats, why are you sending us to an “Upscale” Restaurant for lunch? BECAUSE THEY HAVE THE BEST LUNCH DEAL ON WALL STREET. 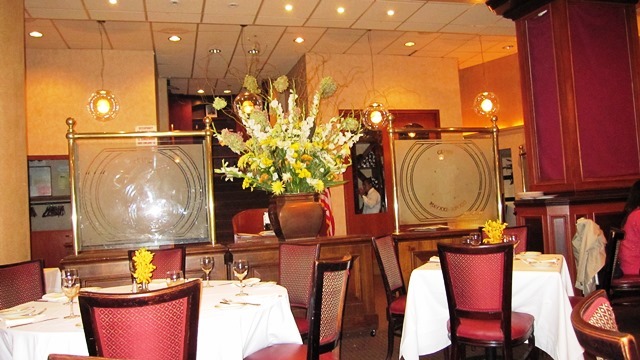 In addition to their brilliant in-house dining menu, which is perfect for a business lunch, special event or special someone, they offer a $14.95 takeout menu. We were graciously invited to try it out by owner Peter Vulli. So we hopped on the 4/5 train and headed downtown. Peter, with his charming Italian accent, greeted me and showed me around the restaurant. Hearing about the road to recovery after Hurricane Sandy, just warmed my heart…. and made my stomach growl. Instead of taking my takeout lunch out, I sat at a table and enjoyed the ambiance of the restaurant and a glass of vino. I requested fish and the let the chef do his magic. 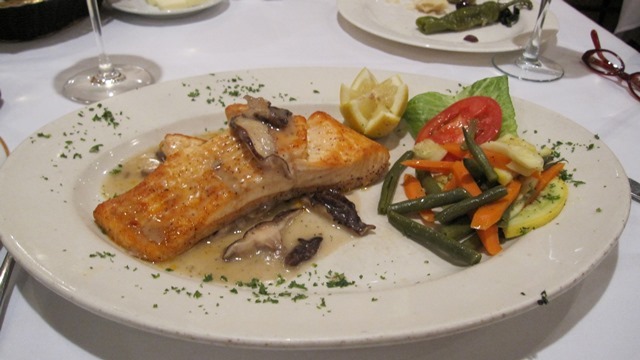 A beautiful dish of Salmon with Shitake Mushroom sauce and veggies, was placed down in front of me and instantly the aroma filled my senses. You can choose either pasta or salad. I decided to go with pasta. In my opinion, the true test of a good Italian restaurant is their bread and sauce. Plain and simple. So I wanted to see how good was their sauce. One word….OUTSTANDING. Their tomato sauce was so sweet and had pure tomato flavor. And the pasta was cooked perfectly…Al Dente. My Salmon was moist, light and full of flavor. Now if you are a a real Italian, you know they overcook vegetables. They cook them so long, they’re mushy and are left with no nutritional value. ( I’m sorry, is that only my family?) But these veggies were cooked perfectly. They still had their bright colors and bite to them. 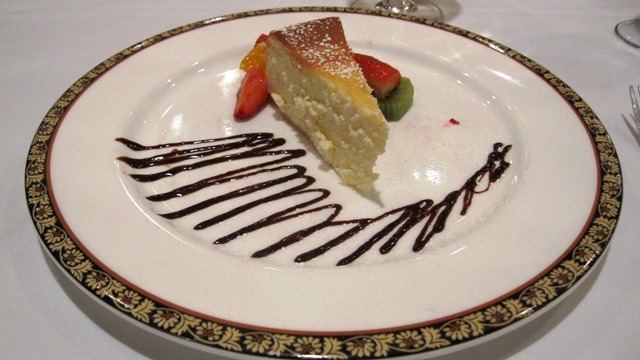 Perfection on plate. Wall Street is all about the deal, so let’s talk numbers. You have a choice of the following lunch boxes, that can either be picked up or delivered straight away. 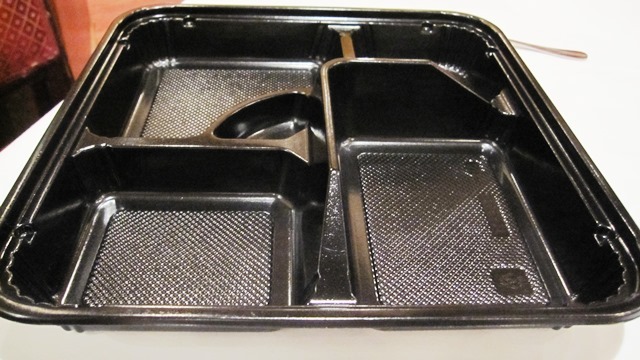 It comes in a plastic container with compartments, to separate the components to the meal. The lunch boxes come with bread, veggies, entree with a choice of salad or pasta and a drink for $14.95. The portions are large and if you are really crunching numbers and depending upon your appetite, you might get 2 meals out of it. I finished my fish but couldn’t finish my pasta. 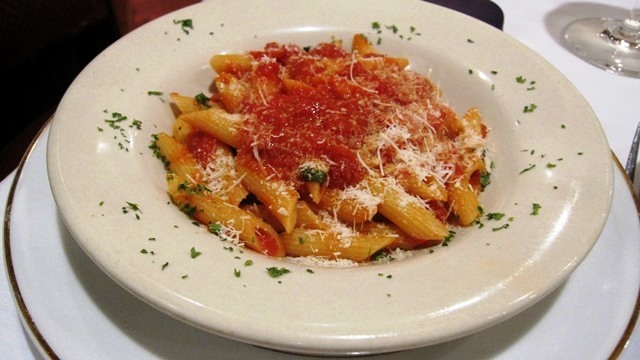 Note to self…..save your pasta for the next day. Picture it, you’re in the conference room, you’re working through lunch and the company orders in lunch. What do they order? Cold Sandwiches. NOT AGAIN!!! Instead, order a hot lunch that will hug your belly and make you happy. Remember… a happy worker is a productive worker. And if I were you, get a slice a cheesecake to go. This entry was posted by Rosemarie on Wednesday, October 30th, 2013 at 6:07 pm	and is filed under Financial District, Italian, Manhattan. You can follow any responses to this entry through the RSS 2.0 feed. You can leave a response, or trackback from your own site.